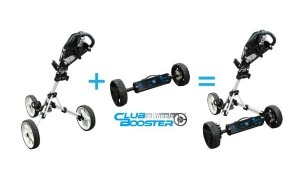 WHAT IS CLUB BOOSTER EWHEELS? 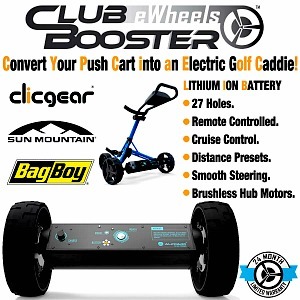 EWHEELS is the world’s first ever lithium battery powered wheels that converts any pushcart into a remote-controlled motorized electric golf caddie. Have your bag accompany you rather than hinder your enjoyment of the game. Many say walking is better than riding, but there's no need to carry your bag, or even push it. With ewheels, all your golf equipment will always in the right place at the right time. When you’re traversing up and down a hilly course, you don’t want to be pushing and pulling your gear from hole to hole. The constant stops and starts can be draining and hard on your neck and shoulders, all of which negatively impacts your performance. Get around the course quicker and easier with less effort. 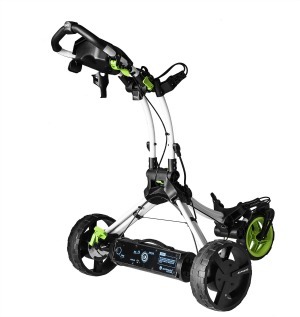 The ewheels carts are perfect for hilly golf courses and on those with downhill inclines. 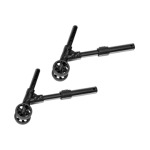 The ewheels unit is compatible with the list of carts below. You simply take the wheel assembly and brackets off of your existing cart, and install the ewheels unit with it's brackets, onto your cart. It is highly recommended to have a cart with a front swivel wheel, which enables the ewheels unit to work more efficiently. 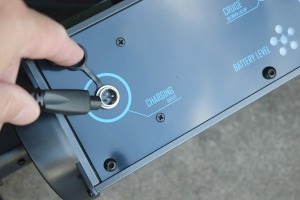 One of the unique features of the ewheel unit is that , on the fly, you can turn your unit into a freewheeling push cart. 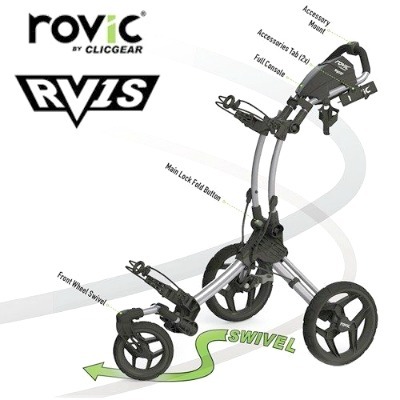 Having a swivel front wheel makes this work so much more efficient for moving the unit around tight spaces and walking to the first tee. This is why we recommend the purchase of a Rovic RV1S Swivel by ClicGear. 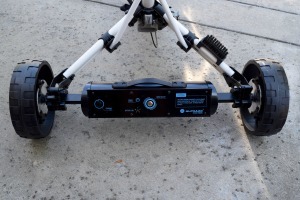 DIMENSION (COLLAPSED): 25" x 11" x 11"
DIMENSION (EXPANDED): 33" x 11" x 11"
We have been selling these ewheels since they were brought to North America and they are quite frankly the next generation of remote controlled carts to dominate the market. 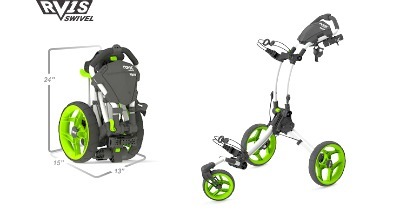 They run very quiet, for up to 27 holes, charge in less than two hours, don't have to be charged all the time, easily put together and transported, even run backwards with the remote, have various speed and distance controls, all the accessories you need, and now have wheelie bars for added stability, and are priced right. See below for our pricing. 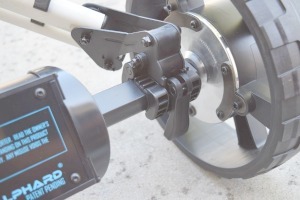 Alphart is the manufacturer of ewheels. For a great video series on assembly and operating instructions. 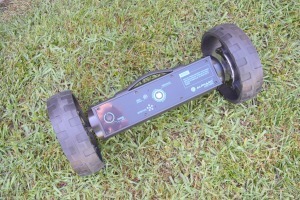 ewheels unit: $ 799.00 CDN. All prices are f.o.b. Woodstock, Ontario, Canada, Do not include any applicable taxes.